Hinge still on back, Small cut on lower edge. 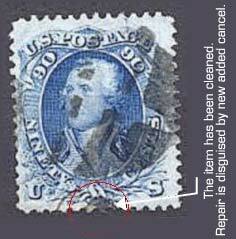 The stamp on the left was cleaned, repaired and received an extra cancel. It has found a new life on the right. FRESH, BRIGHT AND CLEAN. 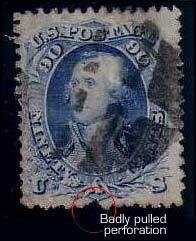 VERY WELL CENTERED.RATHER LIGHTLY CANCELLED FOR THIS USUALLY HEAVILY CANCELED STAMP. THERE IS A SMALL PATCH ADDING ONE PERF BUT THIS IS ONLY NOTICEABLE FROM THE BACK. A GREAT STAMP!! !